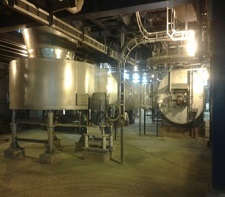 Spray dryers are devices used in spray drying. It takes a liquid stream and separates the solute or suspension as a solid and the solvent into a vapor. The solid is usually collected in a drum or cyclone. The liquid input stream is sprayed through a nozzle into a hot vapor stream and porised. A nozzle is usually used to make the droplets as small as possible, maximising heat transfer and the rate of water vaporisation. Droplet sizes can range from 20 μm to 180 μm depending on the nozzle. 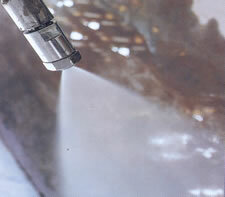 Spray dryers can dry a product very quickly compared to other methods of drying. 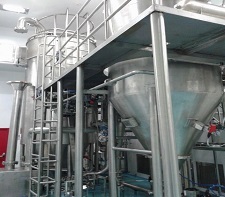 Spray Dryers are custom built designs having various atomization and flow patterns to suit the feed and product characteristics and can be used for drying of versatile range of products. A high speed rotating disc is used for atomizing the liquid feed. The disc throws the liquid outward tangentially at high velocities forming fine droplets / mist by impacting with relatively slow moving hot air. Instant drying takes place due to extremely large surface area to volume ratio converting liquid/slurries into free flowing dry powder. Discs designs include straight / curved vanes, pin wheels, multilayer discs in diameters of 60 mm, 100 mm, 160 mm, 250 mm & 350 mm for different capacities. For high temperature applications special water cooled bearing arrangements are available. 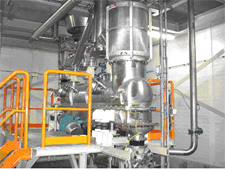 Feed solution or slurry at high pressure is atomized through a nozzle into fine droplets and then dried instantaneously. 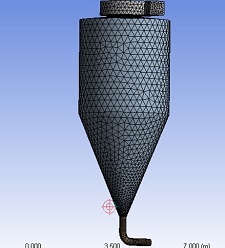 Various types of airflow patterns are possible with nozzle atomization systems. 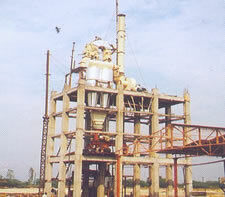 Nozzle type spray dryers are used to produce material in the granular, non-dusty or powder form as required. Depending on the desired physical properties of end product, the choice of co-current, counter current or mixed air flow is selected. Closed loop spray dryers are used when the product to be dried is oxidisable or laden with flammable / explosive solvents, nitrogen purged. In this case, closed loop systems are preferred. Wall cooling arrangements are provided on Spray Chambers handling products of thermoplastic nature. The arrangements include and external cooling air jacket and / or internal rotating arms with air jets to form AIr Bloom on the chamber wall. Spray Dryers with integrated Fluid Beds are ideally used to meet special particle size, dispersibility and bulk density requirements. 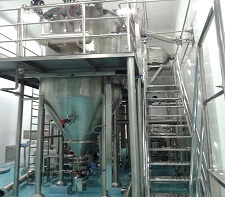 The spray comes in contact with fluidized dried particles and agglomerates. 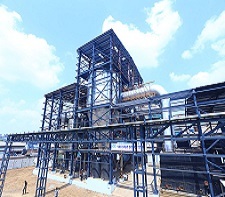 External fluidized bed systems are provided for finish drying, de-dusting and product cooling. The Standard plant of Mini Spray dryers is complete with Electrical air heating system. Spray chamber, Cyclone separator, Bag filter, Air handling fans, Feed tank, Feed pump, Rotary atomizer, Operating panel, Instruments. 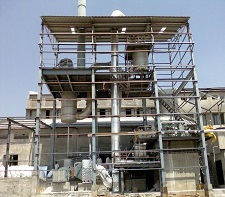 Spray dryers plants are available in Stainless Steels grade AISI 316 or AISI 304, for feed and product contract parts. Other materials can be offered on request. Let us look at the operational featuers of Mini Spray dryers. 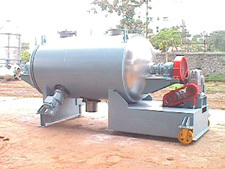 Fluid Bed Dryers are offered in static as well as Vibratory Design and are used for amorphous/ crystalline products with relatively close particle size distribution. 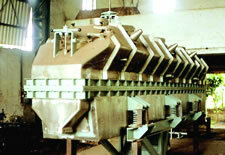 Vibratory fluid bed dryers are used for amorphous/ crystalline powders which are difficult to fluidise. Air fluidisation is supplemented by mechanical vibrations to achieve uniform bed distribution on the perforated plate. The dryer offers better control on fluidisation, residence time, product moisture and dust levels. 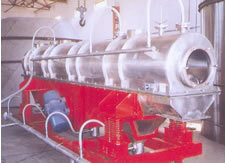 Static fluid bed dryers are used for crystalline powders which are easy to fluidise. Air fluidisation is possible due to fairly uniform particle size distribution. 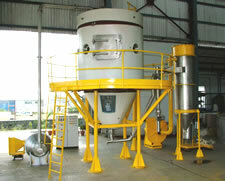 Flash Dryers are used for drying of wet cakes, crystals or granular products, sticky or non-sticky in nature. These are long ducts carrying hot air at a high velocity and the material is dried while it is pneumatically conveyed along with hot air. For lumpy materials size reduction is required to enhance the drying rate. These are ideally suited for such applications. Recycling of hot gases for better thermal efficiency. Rotary Dryers are rugged and robust in construction. The solids to be dried are showered in a hot stream of air and dried during travel through the dryer. 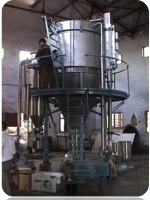 Direct Rotary Dryer comprises of a rotating inclined shell through which a hot stream of air flows. The wet material present in the rotary shell is lifted by means of spiral flights and showered in hot flowing air. Due to this direct contact, the product is dried. The internals are designed to ensure uniform distribution/showering over the entire cross section. The entire shell is supported on rollers /tyres and rotated by means of girth gear or by means of a friction drive. Sealing arrangement are also provided so as to have a minimum air leakage and product/Thermal losses. 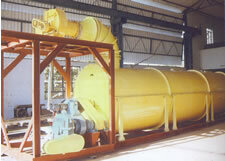 Indirect Rotary Dryers comprises of a rotating shell having a concentric inner shell. Hot products of combustion passed through the inner concentric shell not coming in contact with the product. The product is dried by radiation and conduction. Products which can get oxidised or flammable can be dried very easily. This range of dryers employ the conduction mode for drying. These dryers ensure low temperature, gentle drying of the product. Conduction dryers are designed taking into consideration the wet and dry product flow characteristics, lump crust formation tendency and thermal sensitivity of the product in dry condition. 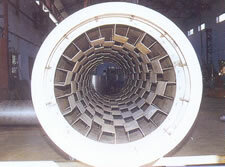 Indirect Steam Tube Rotary dryer comprises of tubes fixed to a rotating shell. Steam is passed through the tubes. The wet material present in the rotary shell is lifted by means of spiral flights and showered on the steam heated tubes. 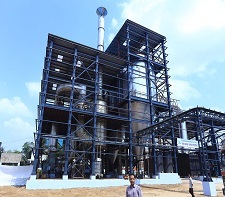 The product is dried by means of the indirect contact with steam. The entire shell is supported on rollers and rotated by means of girth gear. The sealing arrangement is provided to have minimum air leakage and product losses. A Tube Bundle is like a heat exchanger, rotated in a stationary insulated housing. Lifters provided on the tube bundle lift the material and shower them on the hot tube bundle surface. Steam is passed from one end of Tube Bundle for drying and condensate is removed from the other end. Vacuum dryers are used to facilitate rapid and low temperature drying of heat sensitive products without raising their temperature. 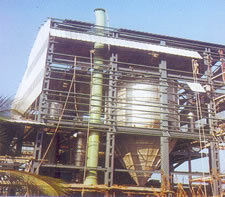 The Double Cone Vacuum Dryer is jacketed on the outside for steam / hot water heating. 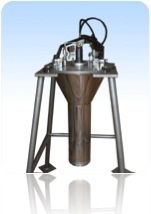 The double cone is rotated through a chain drive and vacuum is applied in the chamber through special rotary joints. 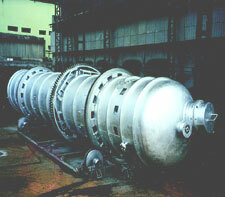 These dryers are cylindrical jacketed chambers and are equipped with a central shaft to which paddles or ribbons and scrappers can be attached for agitation and mixing. Vacuum in drying chamber allows drying of internal at low temperature. Low temperature agitated vacuum drying. Ideal for heat sensitive products, which can be agitated. To make our customers realize their product potential right from conceptualization to make informed decisions, we need to rely on advanced design solutions to meet complex and competitive business environments. At MOJJ,with our CFD based design optimisation we serve as an important link for our design team and manufacturing team to help realise product optimisation right from ideation to realization. We have successfully completed complex and critical projects by our CFD Team. Our team collaborate together, to deliver solutions to our clients and create more value for the end customers. Our engineering facility is equipped with state-of-the-art hardware and leading professional CFD solvers, capable to handle large and complex geometries. Increasing complexity in dryers and mixing devices is posing challenges to manufacturers to evaluate conventional product testing methodologies. Our CFD solutions for multiphase flow assists design engineers to optimize the design of equipments involving drying, mixing and separation of fluids present in multiple phases. 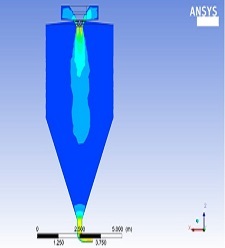 With proper application of turbulence models and flow equations, our analysts helps in evaluating the performance of mixing or separation devices as well as predict the interaction between the solid and liquid or gas particles. The solution also helps engineers to visualize droplets and track particles without conducting experimental investigation. . Predicting particle size, trajectories, collision and breakup can provide key information to engineers with respect to the product design right from the initial design phase. 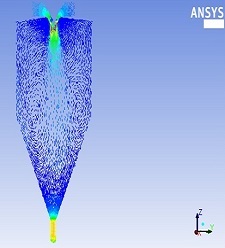 Design can be modified against the simulation results predicting the particle deposition and growth rate due to obstacles in the design, allowing final design to remain flawless.